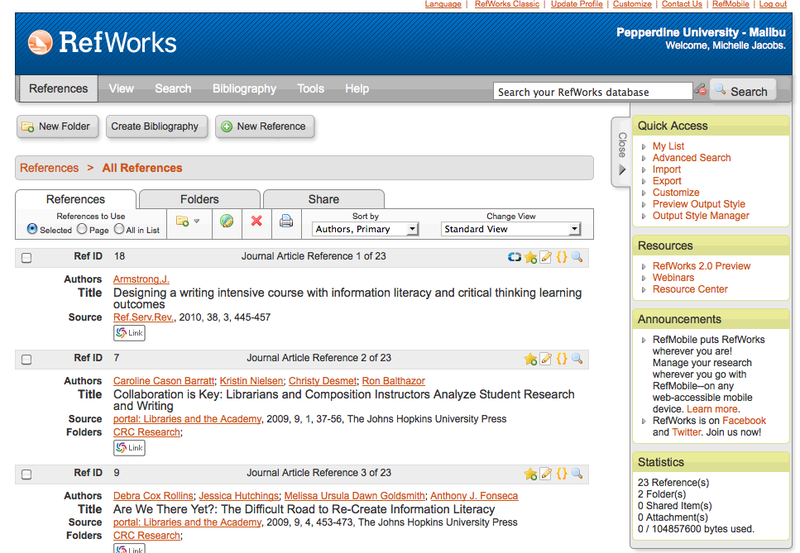 Many online databases make it simple to import citations into RefWorks. Below find information on importing from your favorite database. Cite - displays the Citation Viewer used by One Line/Cite View to insert temporary citation placeholders into a document. Edit - allows you to edit the existing reference information. NOTE: Edit also allows you to Attach articles to the saved references, so you can access the article at any time. Add to My List - allows you to place the selected reference in the My List temporary folder. Attachments - indicates files are attached to the reference. When you mouseover the attachment icon, the file name(s) appear. Clicking on a specific file name will launch the file (provided you have the appropriate software to view the file on your computer). Go to the Edit icon to attach files to the reference. Comments - displays any comments made by others who access your shared references. Folders - if the reference is stored in a folder (or folders) you will see the folder name(s) listed. You can click on a specific folder name to access all the references in that folder. This is an option that you select from the Customize area. Link Resolver - if your organization uses a link resolver, you will see either the name or a logo for the link resolver. Clicking on that link or icon may provide you with access to the full text of an article or identify if that reference is available locally at your organization. This option must be established by your local RefWorks Administrator in the RefWorks Administrator Tool.